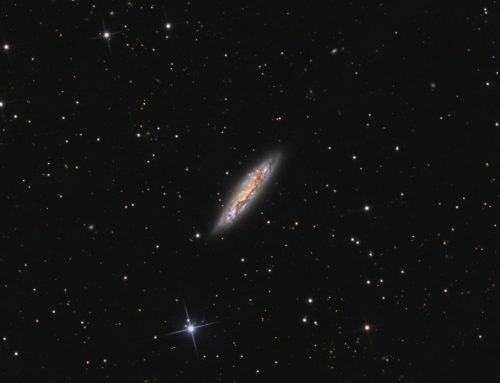 NGC 2403 lies in the northern constellation Camelopardalis, the celestial giraffe. It shows many pink nebulae and blue star forming regions, as well as some dust features. 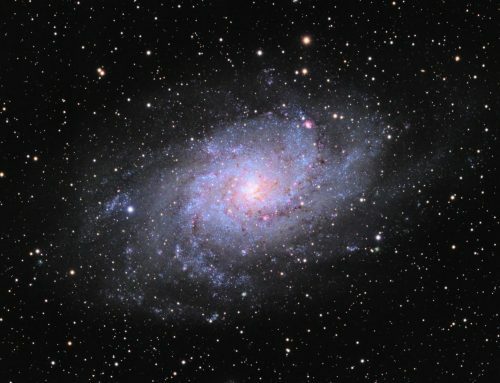 It reminds me of M33 in Triangulum, but it is much smaller on the sky. 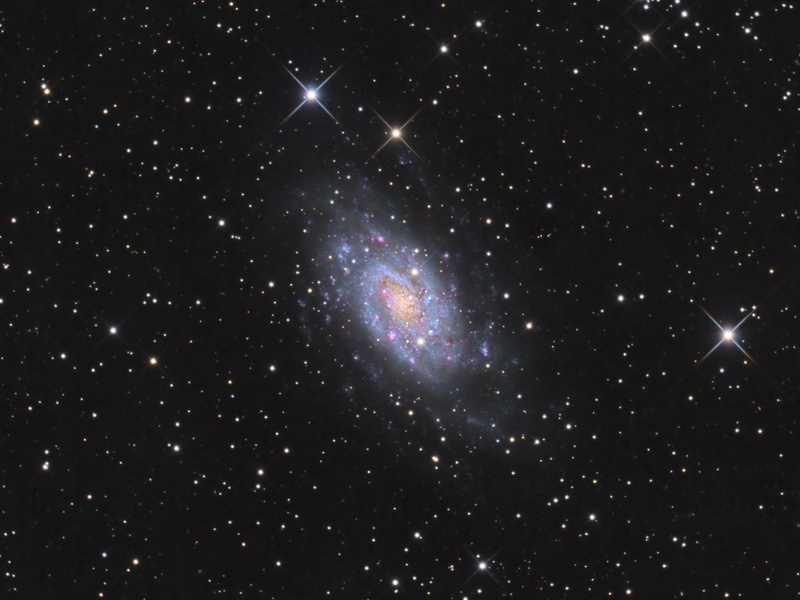 NGC 2403 lies about 8 million light years away and is 50,000 light years across. This galaxy is a member of the M81 group and was discovered in 1788 by William Herschel. It’s relatively bright and I’ve seen it in binoculars in a dark sky. 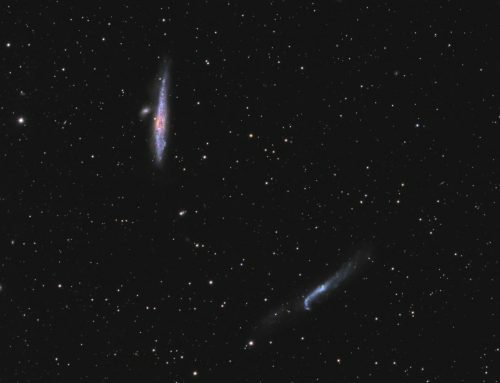 SBIG STL-11000M camera, Astrodon LRGB and Baader Ha filters, 10″ f/6.8 ASA astrograph, Paramount MX. Guided with STL-11000’s external guider and 80 mm f/6 Stellarvue refractor. Acquistion, guiding and calibration with Maxim-DL. Focusing with FocusMax. Automation with CCDCommander. Registration, integration and processing in PixInsight. Shot from my SkyShed in Guelph, Ontario. Moderate moonlight for RGB, no moon for L; gibbous to full moon for Ha. Acquired March 2015. A previous version of this photo was selected as Amateur Astronomy Picture of the Day in May 2015. Image scale is about 1.1 arcsec per pixel for this camera / telescope combination. StarAlignment was used to align all calibrated frames. ImageIntegration was used to make the Ha, L, R, G and B masters. DynamicCrop was used to crop all the masters identically. DynamicBackgroundExtraction was applied to each master twice, first with Division and then with Subtraction. Creation and cleanup: The R, G and B masters were combined with ChannelCombination to make an RGB image which was processed with PhotometricColorCalibration. Linear Noise Reduction: MultiscaleLinearTransform was used to reduce noise in the RGB image. Layer settings for threshold and strength: Layer 1: 4.0 0.9 Layer 2: 3, 0.75 Layer 3: 2., 0.6 Layer 4: 1.0, 0.2. Stretching: HistogramTransformation was applied to make a pleasing, bright image. Creation and cleanup of SynthL: The cropped and background-corrected L, R, G and B masters were combined using ImageIntegration (average, additive with scaling, noise evaluation, iterative K-sigma / biweight midvariance, no pixel rejection). Deconvolution: A star mask was made to use as a Local Deringing Support Image. A copy of the image was stretched to use as a deconvolution mask. Deconvolution was applied (80 iterations, regularized Richardson-Lucy, external PSF made using the PSFImage script; Global dark deringing = 0.04). Linear Noise Reduction: MultiscaleLinearTransform was used to reduce noise in the background areas, using an internal mask to protect bright structures. Layer settings for threshold and strength: Layer 1: 4.0 0.8 Layer 2: 3, 0.7 Layer 3: 2, 0.5 Layer 4: 1.0, 0.1. Deconvolution: A star mask was made to use as a Local Deringing Support image. A copy of the image was stretched to use as a range mask. Deconvolution was applied (80 iterations, regularized Richardson-Lucy, external PSF made using the PSFImage script; Global dark deringing = 0.03). Linear Noise Reduction: MultiscaleLinearTransform was used to reduce noise in the background areas of the Ha image. Layer settings for threshold and strength: Layer 1: 4.0 0.9 Layer 2: 3, 0.75 Layer 3: 2., 0.6 Layer 4: 1.0, 0.2. Stretching: HistogramTransformation was applied to the Ha to make a pleasing, bright image. SynthLRGB: The SynthL was applied to the RGB image using LRGBCombine. 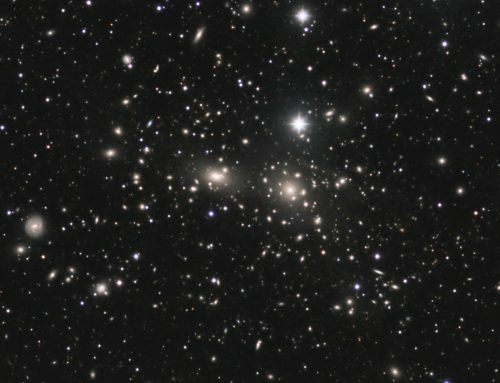 Nonlinear Noise Reduction: TGVDenoise was used in L*a*b* mode to reduce noise in the background and dim parts of the galaxy. Contrast Enhancement: LocalHistogramEqualization was applied with a scale of 50 (max contrast 1.5, strength 0.3, 1 iteration), followed by a scale of 150 (max contrast 1.5, strength 0.25). HDRMultiscaleTransform was applied to a clone of the image and blended into the original using PixelMath and a mask that selected only the core of the galaxy. Sharpening: MultiscaleLinearTransform was used to sharpen Layers 2 and 3 with strengths of 0.15 and 0.11, respectively. A mask was used to select only brightest features of the galaxy for sharpening. Final Steps: Brightness, contrast and saturation were adjusted in several iterations using CurvesTransformation with various masks as required. Background, galaxy core, galaxy arms and stars were adjusted separately.